“Ruuuuuuuuuun!! !” my father would scream from the chalked sidelines of the 100 yard dash (pre metric system days), the guttural, almost animalistic quality of his voice spurred my short little legs to turn over faster and faster until my chest hit the ribbon at the end. “Run THROUGH the ribbon he would say – never slow down until you have gone through that ribbon!”. He had already explained previously that races are lost in the final few feet of a race and you can never hold back….even for a second. 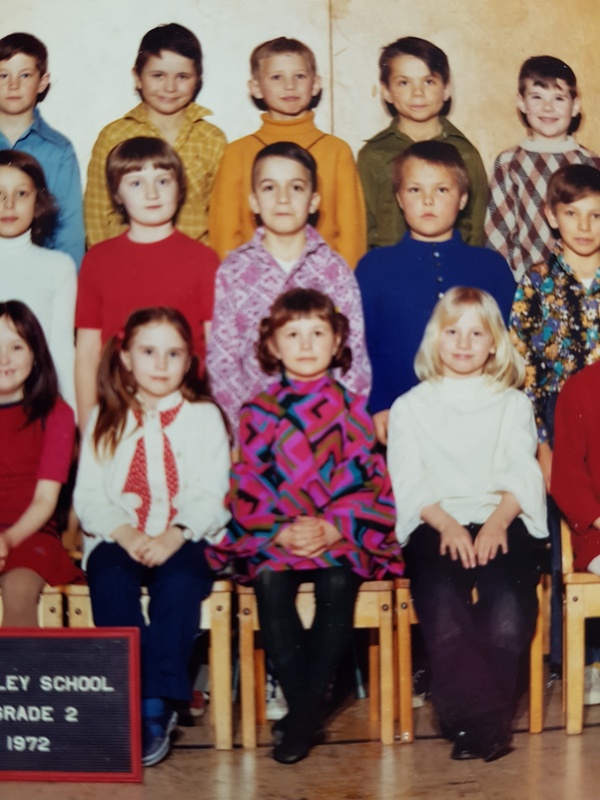 I was probably in grade 2 at the time, but already my type A over achieving personality was developing. I was also a people pleaser and the most important ‘people’ was my father so I was going to win each race or competition if it killed me! Sports Day in a small town was a BIG deal back in the day. In our tiny community, parents took a break from farming so that they could attend Sports Day at The School. I say ‘The School’ because there was only one school and it housed every grade 1 through 12. I am not going to say that the torch of past rivalries were handed down to the children to carry like a anxiety ridden, emotional burden……but….let’s just say there might have been some sideline betting and perhaps some quiet parental pre-race whispers of “Did I tell you that I won this race when I went to school?”, followed with, “Just do your best”. Basically, my father was the 1972 version of a hype guy. Sports Day was always an extremely hot, sunny day: Pre-global warming so no sunscreen tucked into a backpack (BACKPACK? What the heck was a backpack?). There were no cooling shelters, no hovering parents or teachers ensuring we were hydrated. There were hot dogs and full sugar pop and candy and SILKY, SOFT, BEAUTIFUL RIBBONS that were pinned to your chest that blew in the wind like little flags. Dogs these days are more cared for than we were as children circa 1970’s. Running long jump, standing long jump, 100-yard dash, ball throw and high jump were set up in the large field behind the school. Field competition was big, but the track competition was the biggest. I had already won 1st place in every field competition and the ribbons were pinned to the front of my white t-shirt. There was no way that a blue ribbon would sully the beautiful sightline of the silky red ribbons – no second place ribbon for me and if I was somehow relegated to receiving a [gasp] white third place ribbon…well…..I cross that bridge when I came to it. The racing happened at the end of the day – about an hour before the buses began lining up to take us all home. 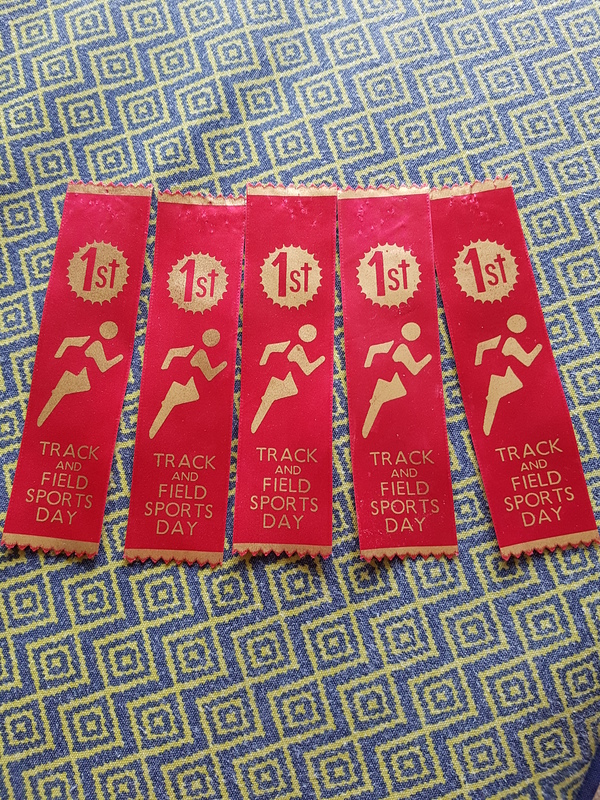 The uneven grassy surface had been measured and marked with lanes and as each heat was run, my chances for that coveted 1st place ribbon grew within reach. I Usain Bolted the heats….barely breaking a sweat as I dispatched my fellow grade 2 students one by one. Until……it was the final race and I was standing shoulder to shoulder with Patty….my nemesis. Patty was tall and thin with long hair that hung straight down her back in its shiny glory. Patty was pretty like Susan Dey from the Patridge Family and we competed in everything. We both vied for the top spot at our small school. Need I remind you: we were both 7 years old. Mr. Rampuri held the starter pistol high above his head and said the magic words, “Get Ready, Get Set……GO!! !” and go we went….running as fast as we could over the uneven, grassy field, never stopping….not for a moment until the familiar pressure of the tape against my chest indicated that I was the victor. Patty was only one step behind and took her loss in stride, seemingly bored with the entire proceedings, a demeanor that only popular, pretty girls can carry off. This day I was the winner. This day I went home with 6 red ribbons, a sunburn and heat stroke. This day I ran to the bus and laid my hot face against the cool red vinyl of the bus seats and prayed that I didn’t throw up. The importance of knowing how to win and lose graciously is not lost on me. Patty and I exchanged the winning laurels back and forth through elementary school until I moved away. As I grew older I realized that I didn’t have to win at something to enjoy it, but that I needed to always do my best and having competition inspired me to always do better. Don’t let this new world we live in take away the gentle, but firm pressure of trying your hardest, doing your best and making improvements. We may only give out purple participant ribbons these days, but that doesn’t mean that you cannot still celebrate excellence and hard work. ← Eyebrows, Va-jay-jays and Instagram – Oh My!